Your children are adorable! But sometimes you would like someone else, a professional, to take the time to show them how to eat, to shake hands, to stand, converse or how to make introductions. Cheaper than piano lessons or registration to a hockey season, register them for this interactive workshop and watch them blossom. 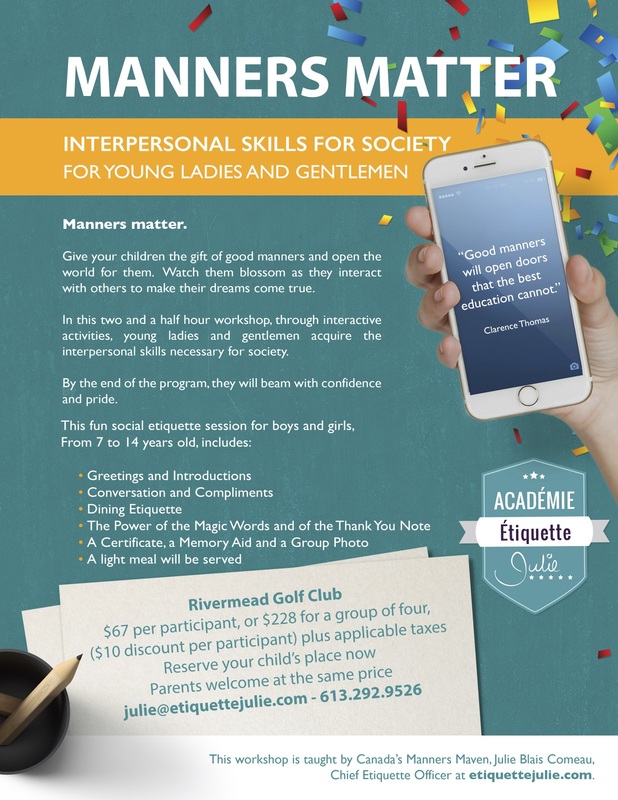 In this two and a half hour session, young ladies and young men, will learn the interpersonal skills necessary for life in society. At the end of this workshop, your child will be confident and proud, ready to shine! Click on the poster to print or share. Places are limited. $67 per participant; includes a light three course meal. Invest in your children and open doors for them. Do you need an energizing training activity for your team? Discover our training themes. Contact us to customize an activity that will target your objectives and meet their needs. In this fun and highly interactive workshop, your child will receive : a certificate, a memory aid to set the table, a photo with the Duke and Duchess of Cambridge, Will and Kate (in cardboard, actual size, plus A snack (provided by Julie, or you if your child has allergies or restrictions). Need a training activity for work? All of our activities are customized just for you!